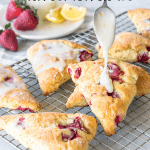 Alright, these are my Strawberry Scones with Lemon Glaze, people! I hope you like them as I do. 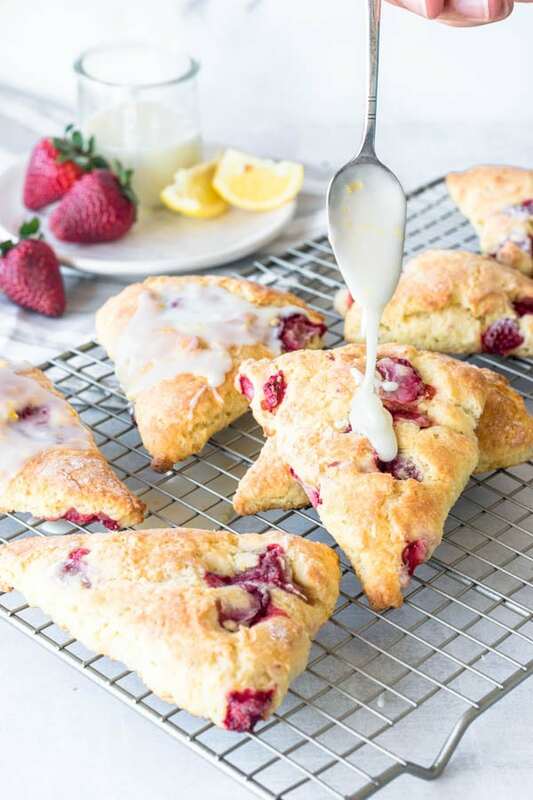 I make strawberry scones every time I’m in Spring/Summer mood. And that’s exactly what I am right now. Today was a bit warmer than other days, but still kinda chilly. 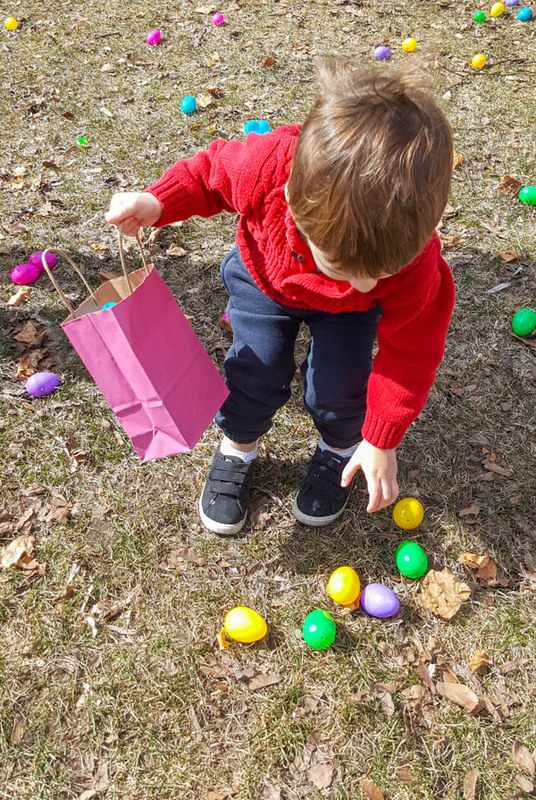 We went on a Easter egg hunt with my son, Luke, and it was fun, even though… chilly! Good thing we had those scones to come back to when we were done hunting for some eggs! Enough about my Spring moods and egg hunts… Let’s get to it! I already gave you some tips on how to bake scones. That was a while back in my Espresso Chocolate Scones with Walnuts. I’ve got some more to say about the matter, though, because I am an avid scone baker. I get upset with the fame scones get of being dry and tough. That really upsets me. Scones don’t have to be dry. They don’t have to be tough. And I don’t need this kind of negativity in my life. Scones are happy treats and they will make you happy! So, when you’re baking scones, do me a favor. Please, first thing, cut up your butter into small 1/2 inch pieces and stick them in the freezer! You want COLD butter. COLD buttermilk. COLD eggs! That’s because the cold ingredients will provide your scone with better texture and layers. Place your scones in the freezer for 15-30 minutes while you pre-heat your oven. Your butter and other fats in the dough (such as the fats in the milk and eggs) need to be as cold as possible when you are ready to put the scones in the oven. The main role fat has, when baking scones, is to provide the texture you are looking for. Don’t ever in your life overmix your scones dough. If it looks completely incorporated, you’ve already overmixed it. Let me tell you how to do this. Add your butter to dry ingredients. Cut butter in, leaving it as pea-sized bits. Then, add your wet ingredients. Mix until they seem ALMOST fully incorporated. When that happens, turn your dough onto a floured counter. Cut the dough in half. Place one half on top of the other. Pat it down lightly to incorporate the pieces together. Repeat this a few more times, until dough finally seems incorporated. This method for folding scones is called pat and fold. You don’t want to overmix your scones. As soon as you add liquids to flour, you start to develop gluten. Gluten is what provides the elastic and strong dough texture. The more you mix, the more gluten you will develop. You do not want a strong and elastic texture for your scones. You want a crumbly, flaky structure. If your scones look done in the oven, they might be tough as they cool down. Keep your eye on them. Watch them like a hawk as they bake! Pull them out as soon as they start to get brown on the edges. When you place the scones in your baking sheet, you can leave them fairly close to one another, about 1 inch apart. This way they will all rise evenly as they bake. 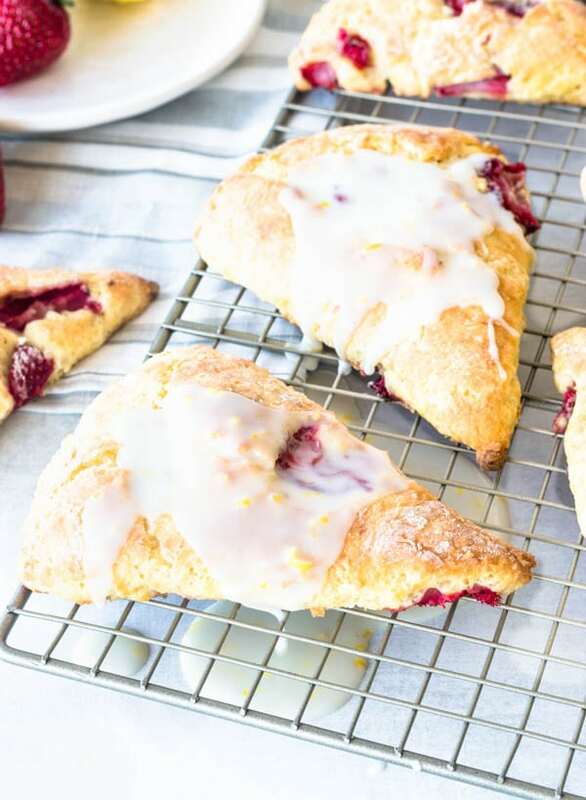 Try to work with a wet dough, without adding too much flour while you shape the scones. Try your best! In any case, flour your hands a little bit to help you handle the dough. I used to work at a bakery and we froze our scones, already baked. And thawed them in the early morning before displaying them on the case. Some say you might freeze your scones pre-bake, but I can’t vouch for that because I have never tried doing it. Most of all, have fun doing this. And of course, I know you’ll have even more fun eating scones! 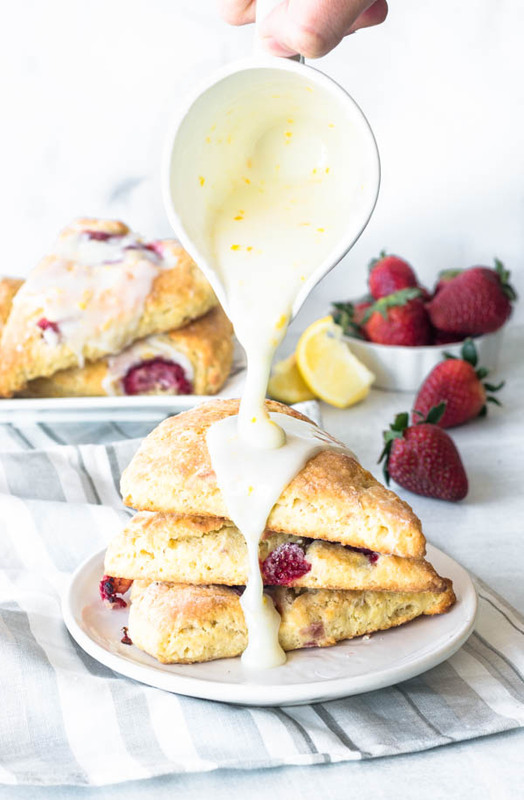 Specially these Strawberry Scones with Lemon Glaze. 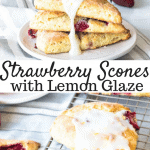 These Strawberry Scones with Lemon Glaze take only a few steps to make. They are fluffy, delicious and will be the star of your breakfast table. Cut butter into pieces and store it in the freezer for 10 minutes or so. Add cold pieces of butter to flour mixture. Use a fork to combine butter and dry ingredients. You can use a pastry blender if you've got one, but a fork will also work just fine. Keep blending butter into dry ingredients until butter pieces are pea-sized. Add buttermilk to mixture. Fold with a spatula until almost entirely incorporated. Add eggs. Fold until combined. Chop strawberries and place them in a couple of paper towels, so they drain all the excess liquid. 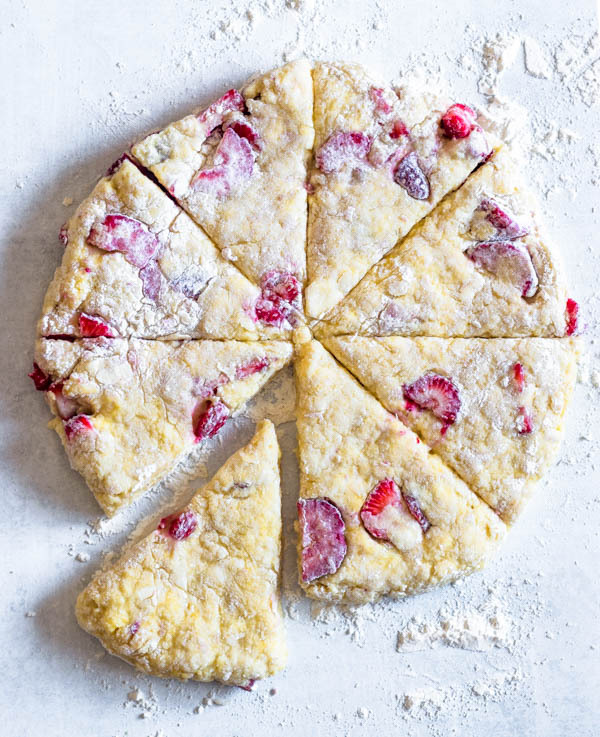 Add strawberries and 2 tablespoons of zest to your scones. Fold with a spatula slowly, just enough to combine ingredients. You actually want your dough to seem like it’s not fully incorporated. Transfer dough to floured counter and lightly press down on it with your fingers, while trying to turn the dough into a circle, about 1 inch high. Slice dough into 8 wedges, like a pizza. Place each wedge about 1 inch apart in a parchment or silicon mat lined baking sheet. Place baking sheet in the freezer while you wait for the oven to pre-heat. Pre-heat oven to 375. Bake for around 15-20 minutes, rotating the pan halfway. Let them cool and glaze scones. Store them at room temperature, in a airtight container, for a day. You can also slide them in the freezer as soon as they are done cooling down from baking. make sure to wrap them tightly. Some say you may also freeze the already cut and shaped scone dough, before baking. I've never tried it. I will next time I make scones. If you have tried this already, please let me know! Mix sugar, lemon juice and zest together in a bowl. Add more sugar if the glaze is too runny, or add a bit more juice in case it’s too stiff. These look amazing, I m going to make them for my Mom and kids.Thank you for sharing! Thank you so much! Hope you like if you do get to try it! These look amazing! I love the combo of lemon and strawberry! And it’s been mind-80’s here in NM! I’m wondering where spring has gone… or if it just skipped over us! 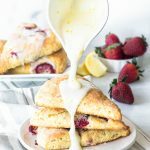 Strawberry Scones with Lemon Glaze sound good and delicious. I like to serve this for our Wednesday lunch. Thanks for sharing. I do hope you try it, Melve! My mom used to work in a bakery growing up and made the most delicious scones, and I haven’t had a good one since. This is inspiring me to make some today!! So yummy! Yes, you should definitely make some!! You got me at scones and strawberries! I am addicted to scones for the longest time and now that there is a bounty of berries in the market this is a great idea. Making yoru recipe soon! 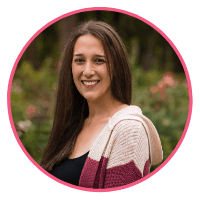 Thank you, Adriana! I’m sure you will enjoy it!! As an Irish girl, I think one of my first foods was a scone! You are spot on with making a great scone. It has been a while for to make scones and I just love your recipe..so I have my weekend baking project, delish! Thank you so much, Eileen!! I hope you do get to make and eat some scones this weekend!!! everyone deserves that every once in a while lol! These scones look amazing! I love the strawberry and lemon combo.